The physiology of flexibility is the science of how and why some people are more flexible than others. Is it purely genetics, or are there other factors? Aging is a major factor in limiting natural flexibility. As you get older, muscles and joints inevitably get stiffer and tighter. However, we don't know how much of this is genetic vs. lifestyle choices. Having a very sedentary lifestyle will accelerate this process of losing natural flexibility, while being active, exercising, and moving around a lot will keep you limber. So, move it or lose it! Especially if you keep stretching and moving around, aging will impact you a lot less. 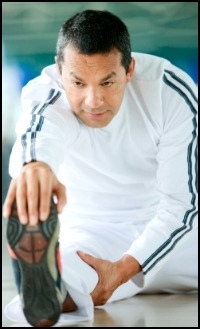 Your history of exercise and activity has a great impact on your own physiology of flexibility. If you spend your time predominantly in an office job or similar occupation, with no cause to use your flexibility, then it will go away. And if you run on the weekends, play sports, do martial arts, run marathons, etc. you will generally be more flexible than your sedentary friends. While this isn't something you're born with, don't belittle it. Habit and choices over the course of our life form us far more than our natural abilities. Gender also plays a role in the physiology of flexibility, since women are generally more flexible then men. Sorry, guys. Still, this is something you can't do anything about. So don't agonize over it. For the vast majority of people, genetic variation will not have nearly the impact on you over the course of your life as your habits and practices will have. Even if you are naturally stiff, if you stretch 10-15 minutes a day, every day, that will make a world of difference. Your ambient level of muscle tension has a great affect on your flexibility. A tense muscle is a short muscle. Most stretching exercises are devoted to causing your muscles to relax in order to lengthen. Muscles don't actually get longer, their cells just stop contracting. Even though their structure is the same as it was before stretching. Your connective tissues can stretch in addition to your muscles, and help you be more flexible. Or not. Most connective tissue is susceptible to stretching, but not to the same extent that muscles are. There is something of genetic luck in how elastic your connective tissue is, but beyond that, exercise stretching will help lengthen your connective tissue along with your muscles. • Click here to leave 'The Physiology of Flexibility: Why You're Flexible (Or Not)' & go back to the Home-page! 1. Walker, Brad. 2007. The Anatomy of Stretching. Chichester, England: Lotus Pub. Pp. 13. 2. Wharton, Jim, and Phil Wharton. 1996. The Whartons' Stretch Book: Featuring The Breakthrough Method of Active-Isolated Stretching. New York: Times Books. Pp. XXV. 3. Mellion, Morris B., Margot Putukian, and Christopher C. Madden. 2003. Sports Medicine Secrets. The Secrets Series. Philadelphia: Hanley & Belfus. Pp. 95. 4. Hyde, Cheryl L. 2002. Fitness Instructor Training Guide. Dubuque, Iowa: Kendall/Hunt. Pp. 136.